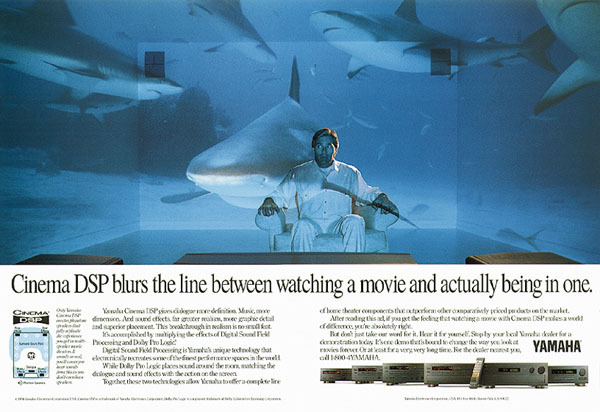 Two images were used in production, the in-your-face sharks and the man in the chair. Chris captured the sharks on film in Freeport, Grand Bahamas Islands in about 35' of water. The female coming straight to camera is about 18 inches from the camera when the picture was taken and bumped the front dome port an instant later. Sharks often do this to "feel" whether something is edible before they bite it. Another photographer did the studio image of the man in the chair. The two images were then composited for the ad. The composite image was used for double page spread ads and 3-D point-of-sale displays in the U.S., Australia, Japan, Southeast Asia and Europe.